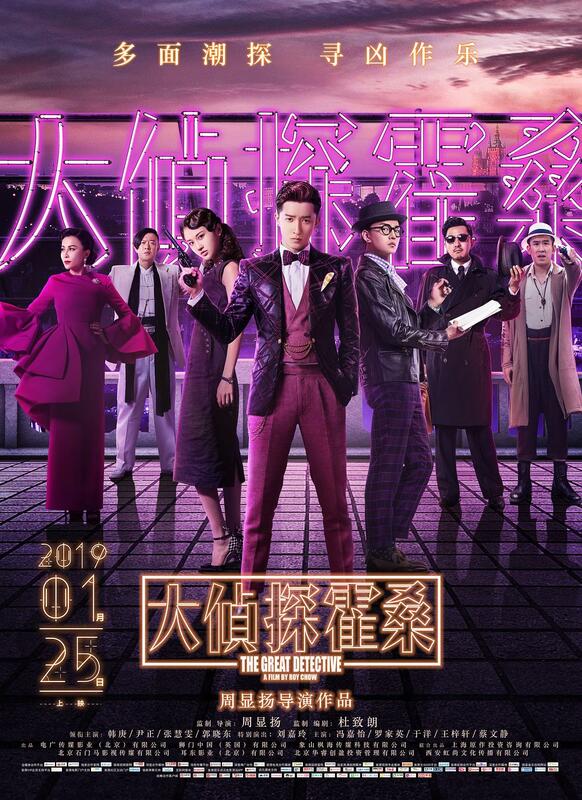 Surfing on the popularity of detective stories across narrative media in China (epitomized by the triumph of the BBC series Sherlock and Chen Sicheng’s Detective Chinatown franchise), The Great Detective suffers from a lack of distinctiveness. We haven’t read Chen Xiaoqing detective stories, but in Roy Chow’s film his hero appears a pale, superficially sexier version of Sherlock Holmes: he’s brilliant at deduction, obsessive-compulsive, condescending to normal people, disdainful to women in general, and flanked by his own Watson, played by a fairly dull Yin Zheng. It doesn’t help that Han Geng plays him with his customary bland swagger and featherweight presence, and that for all the mythification of the character’s investigative genius, what little actual deduction work he does, is muddled rather than clever, shown with ornate albeit derivative onscreen charts (done better in the Detective Chinatown films) rather than with the unrealistic yet plausible machinegun ratiocination of Sherlock Holmes and his Benedict Cumberbatch incarnation. The character of Jiang Yan Nan seems itself directly inspired by Maurice Leblanc’s series of books about Arsène Lupin: Lupin and Jiang are both gentlemen thieves, masters of disguise working for good but outside of the law, with a penchant for philanthropic finger-severing (our readers will understand when/if they watch the film). But with the addition of borderline fantasy elements, like a magic pearl that allows to locate a mythical Qing dynasty treasure, or the fact that Jiang Nan Yan’s face-shifting is never really explained, The Great Detective ends up leaning closer to Tsui Hark’s Detective Dee films, though without the constant shark-jumping. And so it is difficult to revel intellectually in Huo Sang’s investigation, or even to simply care much about it. What’s left is the customary classy sheen of a Roy Chow film: Shanghai and Prague coming together to form the fictional “Golden City”, awash in Peter Wong’s exquisite art direction and captured expertly by Ng Chi Man’s beautiful cinematography, while Yusuke Hatano’s score lilts away with the very playful subtlety of which the film itself falls short. And there’s a final shootout in an expressionistic set – towering columns and almost Escher-like stairs and floors – that while dramatically hollow (the events leading up to it are simply not interesting or engaging enough) is at least gloriously over-the-top (Tony Ling Chi Wah dorects the action) and superbly shot; this despite the odd, apparently inevitable flourish of mediocre CGI. And while the leads are charisma-challenged, the supporting cast is delightful: Carina Lau only cameos, and she’s not far off her powerful Wu Zetian of the Detective Dee films, but she can only class up the whole film, as does Guo Xiaodong as a shady figure about which the less said the better; and Law Kar Ying is amusing as the Lestrade to Han’s Holmes. But it is Zhang Huiwen who steals every single scene she’s in, and indeed the film itself. The all-too-rare (on the big screen at least) revelation of Zhang Yimou’s Coming Home is all spirited energy, exquisite charm and acute comic timing, and hadn’t the film crashed and burned at the Chinese box office, she would have warranted a spin-off at the very least, and a downright takeover of the franchise itself at best. Roy Chow gives himself not one, but two cameos, cementing his status as the M. Night Shyamalan of China, albeit an M. Night whose career wasn’t kickstarted by three excellent-to-classic films.